Tomorrow is May 1st - can you believe it?? April was a really busy month for me and my family, so I'm relieved we have made it here, to the other side - to May! Look at these darling cupcakes, perfect for May Day! 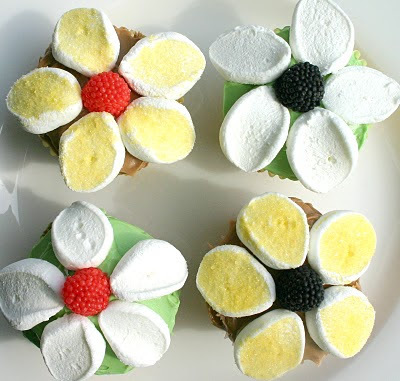 The center of the flower can be any candy, or, you can use raspberries and/or blackberries. To make the petals, take a large marshmallow, hold it lengthwise, and with kitchen shears, snip it into 5 pieces. The marshmallow will make your shears gooey, so you will have to wash them a couple of times during the petal making. I've decided for the non-writerly types that read my blog, I will try to blog once a week about two things I love - cupcakes and cute animals. After all, 2010 is the year of IT'S RAINING CUPCAKES and LITTLE CHIMP'S BIG DAY. So yeah - cupcakes and cute animals - two things that bring a smile to my face and will hopefully bring one to yours as well! I feel like a very bad author these days. I didn't realize how many kids would be so unhappy with an open ending. An ending that ends happily, with the character getting something she wants, but with a question that still remains. I thought - oh, it's not really important to address that. Kids can imagine what happens, and they can see how happy she is just to have gotten there. I am getting e-mail after e-mail after e-mail - kids wanting to know the same thing, and feeling a little disappointed and frustrated that the book ended too soon. And all I can say is, I hope I get the chance to remedy the situation in the only way I know how!! Yesterday, I tried to channel Sheryl Crow. 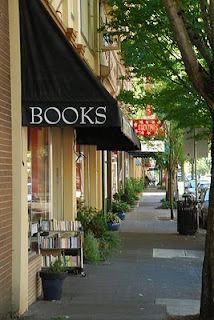 See, a sweet book blogger named Briana (aka The Book Pixie) did a lovely review of FAR FROM YOU awhile back. 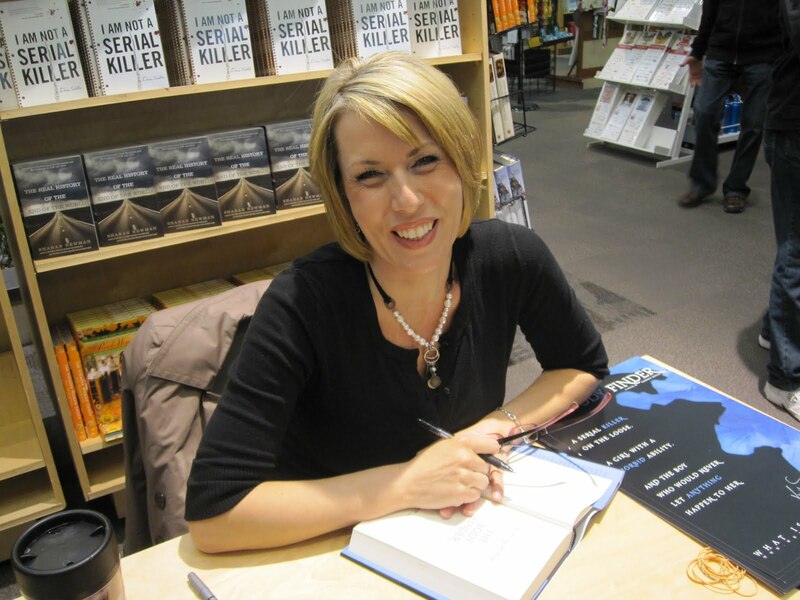 Her blogaversary is coming up, and she decided to highlight books she loved that haven't gotten a lot of attention, and FAR FROM YOU was one of them she wanted to give away. On twitter one night we were chatting back and forth and I said, you know, I've put music to the song that FAR FROM YOU ends with (Alice, the main character is a singer/songwriter). I told her, maybe if I get brave, I can record it for your celebration. Well, she didn't let me forget that conversation! So yesterday, I sat down with the music, my guitar, and my computer and I recorded myself playing and singing the song. It's not that great. I haven't been playing the guitar very long and I still struggle with switching chords. I have to look at my hands a lot, not to mention that I can't even play the whole C chord yet (grumble, grumble, grumble). But I sent it to her anyway. She said both her and her mom watched it, they really liked it, and it's scheduled to go up on her blog May 10th. But she also said she could tell I haven't been playing that long and I was kind of nervous. Yeah. In other words - it's not perfect. Far from it!!! But she is so excited I did this for her. On the one hand, I'm a big believer in working hard and becoming the best you can be. But I also think it's okay to NOT be perfect. To have fun and enjoy life and be okay with where we are with our skills and talents at any given time. I can work on my playing and my singing, and in a year, I probably would do a much better job. But she's celebrating now, and featuring FAR FROM YOU now. So I did the best I could, and I have no regrets. I made her really happy by doing this, and isn't that more important than worrying that I'm not perfect? Last week was a whirlwind for me, but now that I'm back and catching up on stuff, I want to jump on board and point people to the awesome efforts of Guys Lit Wire, Readergirlz, YALSA, and If I Can Read, I Can Do Anything. They are trying to get a bunch of books to two schools for Native Americans - Ojo Encino Day School and Alchesay High School. Please read THIS POST over at Guys Lit Wire, and consider helping out somehow. You have until Wednesday, April 20th and get on board!! I'm doing what I can by sending some of my own books, since I still have a few author copies laying around. Here are the instructions, if you'd like to buy a book or two or fifty, which I'm copying from the original Guys Lit Wire post. "There are wish lists set up for each school on the powells.com site. Once there, click on "wish list" up in the upper right corner. From there you will be prompted for the email address of the list owner. Type in "guyslitwire@gmail.com". You will then be given the choice to select either Ojo Encino or Alchesay. If you'd like to send something other than what's on the list, please send an e-mail to GUYSLITWIREATGMAILDOTCOM." I love picturing those kids' faces as they receive boxes and boxes and BOXES of books for their libraries, after they've had nothing new to read for so long. I really believe books can change lives. So, let's change some, shall we?? After a day of level 4 insecurity (that's high, in case you don't have levels for your feelings of insecurity. What!? Don't look at me like that), I was SO happy to see this picture. 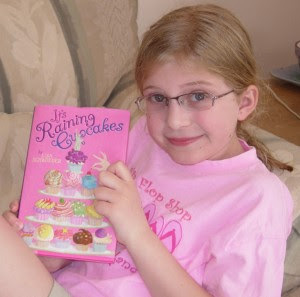 OMG, isn't Abby in her pink shirt holding my pink book just the cutest thing?? It took me down a level, maybe even two. Kids ARE actually reading my books. I may not be an author with a ton of buzz or even a little bit of buzz, an award-winner, a best-seller or (Alert, Alert! Insecurity level rising to level 3. Warning, warning, rising to level 3. Get off computer soon and do something else). In other news, today I must pack and get ready to leave for Texas tomorrow morning. I'm attending the Texas Library Association conference and will be doing a panel with Sonya Sones and Ellen Hopkins (Alert, Alert!...). Our panel will be on Thursday, 4/15, at 1:00 in Room 217. At 2:30, I'll be signing books in the author signing area! If you're there, please come by and say hi, I'd love to meet you!! I may try to do a blog post while I'm there...we'll see. I'll be coming back home really late Friday night, and am so glad I'll have the weekend to recover. I've never been to San Antonio!! I have my mornings free - any suggestions as to things that are a must-do or see? Okay, here is where I point you to the places I've been lately around the internet. Hope you find some of these posts helpful in some way! 1. 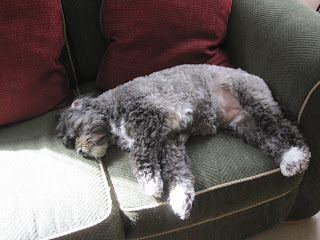 Over at www.teensread.com, I talk about the top ten things to do if you want to write a novel. 2. 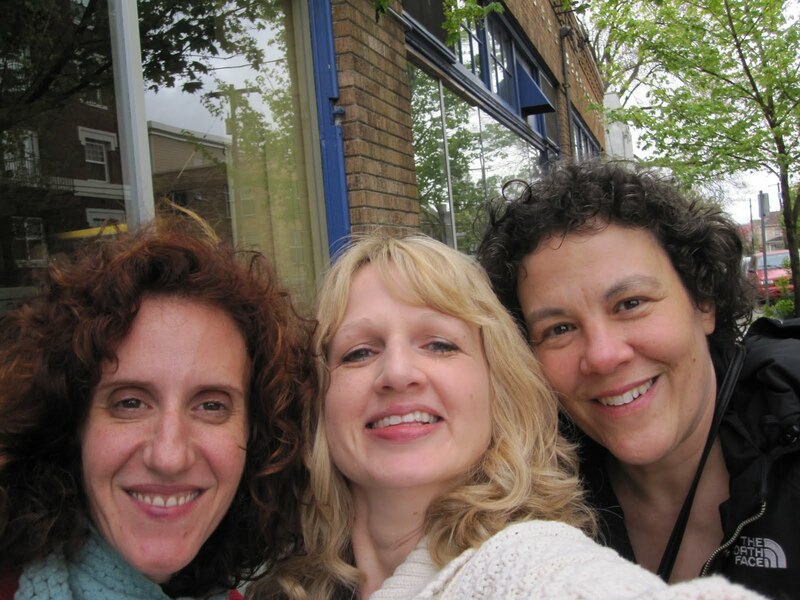 At the Crowe's Nest (a blog for an agent and her clients), I talk about writing for ourselves. 3. 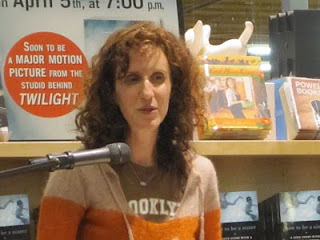 The web site, www.novelnovice.com, selected me as their author of the month for April, and I did a blog post on why verse novels are a good kind of different. 4. Thank you so much for all the congratulations yesterday. I don't know when the new book will be out, but I'm guessing spring in 2011. The book is written, but of course there will be revisions and copy edits and cover design and all of that REALLY FUN STUFF THAT I'M SO EXCITED ABOUT!! 5. Finally, I want to say thank you to a librarian who wrote a review that really touched my heart. It made me teary. It reminded me that sometimes we get so wrapped up in the business of making books, we forget what really matters. This is what really matters. And now, I must get ready to meet my agent for the first time. Fun times! Happy weekend all!! It's been a busy few days here in Portland, with Kimberly Derting coming to town for her debut YA novel THE BODY FINDER and Gayle Forman kicking off the PB tour here for her amazing novel, IF I STAY. When we were done with the book discussion, a nice lady named Celeste, who owns Celestial Cupcakes in Newport and drove all the way to the event to share her cupcakes with the kids, helped the kids decorate cupcakes. Her daughter worked all day to recreate the cupcakes on the cover of my book in a nice display. If you look closely, she worked hard to get all the details right - the colors, the decorations, everything! Wow!! So much fun!! Thanks Anna at Third Street Books, for having me, and thanks to Celeste for bringing your wonderful cupcakes to the event. It's been two and a half months since I quit the day job. I've been busy every day, with writing and promotional things, on top of a new level of busyness where my kids are concerned. My oldest son joined the HS tennis team, and practice times vary because they have to share the courts with the girls. Matches with other schools are long, and go late into the evening. There isn't a day that goes by that I don't wonder, how would I DO all this if I was still working? So in that regard, it was the best decision. I'm so very thankful to be at home, available to my kids in a way I couldn't be before. Yesterday I picked up my oldest son after school when practice was cancelled *after* the buses had already left for the day. I took him out for a taco. We sat and talked and laughed, and it was wonderful. Those are the moments I'm thankful for right now. The moments I'm choosing to focus on. Do I miss anything about working? I miss the paychecks, absolutely. I miss the people I worked with. I miss getting out of the house on days where I'm feeling angsty about this business. As crazy as it sounds, work was sometimes a much-needed break. As an author who works from home, it can be really hard to turn off that part of our brain that is thinking about the current book or the next book, or the books already on the shelves and what else can be done to help sales, or a hundred other things. I'm not good at turning it off, but I'm trying to be better about it now that I don't get that forced break. I'm trying to exercise more. I get out with friends for lunch dates or an occasional movie date on a Friday afternoon. I don't work at all in the evenings, and some evenings, I've decided I just need to stay off the computer, period. So there is progress, slowly but surely. Overall, I'm thankful for less stress in my life. I'm thankful for more time with my kids. And most days, I'm thankful to be able to say my job is that of an author. Who knows what the future will bring, but for now, it's a pretty nice place to be - home with my stories and my kids!